Around the turn of the year we saw a barrage of blogs and articles questioning whether magazine apps were working. The implication being that they are not working at all as planned or hoped for TechCrunch, Matthew Ingram, WWDMedia. The story does indeed look pretty gloomy. But when you study the chart more closely the real problem was the extraordinary success of the first iPad edition from Wired. It throws everything that follows into a gloomy shadow. The GQ and Vanity Fair apps had their limitations, but the results and even the trends were not too bad, given that they were very much ‘first efforts’. Our experience has been much less dramatic but much more encouraging, so there may be a case for giving a few sketchy strokes from another picture. But we first need to note and magazine publishers need to recognize a few key points about the app economy and iTunes in particular. The first point to emphasize is that free apps will get much more traction and much more currency than paid for apps. A free app may get 100 times or even 1,000 times as much attention as an app that the user has to pay for. 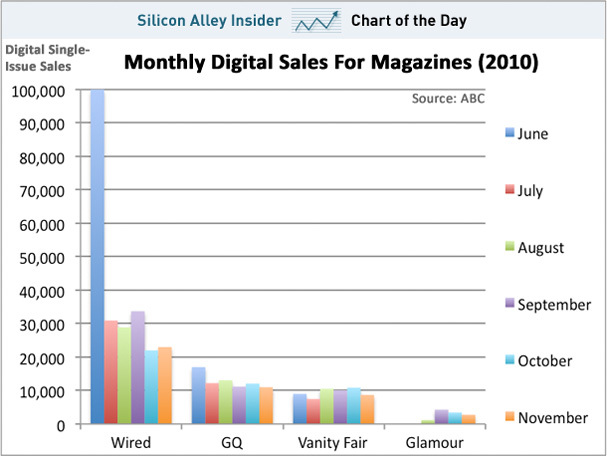 Freemium can work well for magazines. Give some content away for free, and make it attractive and easy to trade up to a paid for subscription. Freemium can work either as sheer promotion, where you do not expect to sell much to the iTunes audience, but you wish to whet an appetite. Or it can work well as a first step on the way to paying for something…. If you are going to charge for your magazine app (and if it is really good and it costs you money to make it you should charge for it), recognize that it is a lot easier to sell an app for 99c or $2.99, or even £4.99 than it is to sell one for €9.99. And selling an app for $19.99 is really tough. I am not sure that consumer purchases can be sold effectively for $19.99 or $29.99 on iTunes. This is a fact about iTunes, where users have got used to spending 99c for a track. Purchasing habits on iTunes are different from purchasing habits using PayPal or Amazon. Recognize that fact before you get too far in. Recognize also that purchasing on iTunes can be very frictionless, easier and smoother than PayPal or a Credit Card. iTunes is different from Visa or MasterCard. At low prices, iTunes is better, slicker, easier than any other e-commerce environment, but not at the prices that many magazine publishers wish to charge for annual subscriptions. iTunes has an amazingly large audience. You cannot ignore it. You should use it to extend and embrace your existing audience. Make sure that your pricing works for your existing readers and your new readers. Make sure that your pricing makes sense to your existing print subscribers. Think about that. One of the key things about the iPad is that it has given publishers a good reason to re-engage their existing audience in the concept of digital access. We think that this is the really, really good news about the iPad. Digital subscriptions for your existing audience are a key part of the reason for embracing the iPad. The point is that a magazine publisher can quickly and efficiently convert his print audience to a digital audience at low cost using free access to the digital feed as a reward for print subscribers. That way the circulation of the print audience is confirmed and strengthened and at the same time a new digital only audience can be won. Because the publisher sells digital access (via iTunes or directly) to those customers who do not want to buy the print service. The data about the uptake of apps using the Exact Editions platform is confidential to the publishers of the magazine concerned. But we can publicize a few data points about the uptake of two nameless magazines. These are both high quality consumer magazines with an international but mostly ex-US audience. Both magazines have had freemium apps in the marketplace for several months at affordable prices (£4.99/$6.99 or less for 30 day subscriptions). Both have had respectable uptakes. In the case of magazine A, there have been nearly 50K freemium downloads and nearly 2K purchases. In the case of magazine B, there have been nearly 20K downloads and approaching 3K purchases. Incidentally, when publishers see this data, they are sometimes surprised by what appear to be ‘low’ conversion rates. Publisher B was inclined to put in some ‘pre-qualifying’ friction when he saw the rates (eg a form collecting email addresses); publishers with this reaction are severely underestimating the ‘friction-free’ style of iTunes and are also underestimating their need for exposure and promotion. The appropriate reaction would have been “Why haven’t I had 60K downloads?” A 2% purchase-response rate is good for iTunes freemium apps. For both magazines the monthly purchases have been reasonably steady, steadily growing, and have shown a good ratio of renewals (ie renewals through iTunes). The renewals figure is perhaps the most telling point about the data. Apple has not yet implemented a really easy form of renewal, and it will be very much in Apple’s interest for them to offer a form of ‘automated’ or ‘unless I say otherwise’ renewal, but even so magazine subs are being renewed at an encouraging rate. Neither we nor the publisher know who these renewing customers are, but Apple does give one sufficient data to tell that specific user ID’s have repurchased. Another point that gives us some confidence in the iPad and its future is that these are still early days. Neither of these ‘respectable’ consumer magazines have had anything like the promotion and attention of the Wired or the GQ apps. The publishers have given them some ‘mind share’, and some linkage and advertising via web pages and email campaigns, but I am pretty confident that the promotional budget in both cases has been ” low to minimal”. Sensibly enough, the publishers concerned have opted for low risk promotion and advertising because they have been experimenting, assessing reactions and feedback. These are still early days, because the iPad is not yet 10 months old, there are still barely 10 million iPads in the market place (many of them in the US). The potential for consumer magazines when there are 50+ million iPads in the market (ie early 2012) is obviously much greater. Another factor that gives me confidence in the potential for publishers making significant profits from their digital editions is that these two publishers have for different reasons not yet begun to exploit the full range of access options for their public. Publisher A has been promoting digital subscriptions through the web, but has not yet offered ‘universal subs’ to his existing print subscribers. When this is done he will experience a big uptake in app usage and app sales. Publisher B has not yet begun to promote or advertise the option for web subscriptions to the digital edition, when he does so there will be a substantial increase in digital revenues. The Exact Editions platform allows the publisher to promote digital subscriptions across the range: (1) directly as web subscriptions to a purely digital service (2) through iTunes as a way of selling 30 day subs to an iTunes audience; and (3) as an added value service to the existing, renewing and new print subscription audience. It is the potential publishers now have for a cross-platform and integrated, convergent solution for the magazine audience that is most exciting innovation about the iPad. Apple deserves a lot of the credit for that.